You ask most kids of the '80s, and they'll tell you the leader of the GI Joe team was Duke. He was top kick on the cartoon, followed by Flint and then whoever else was best suited to the situation at hand. It wasn't until Season 2 that Hawk showed up, even though he'd really been around for years. 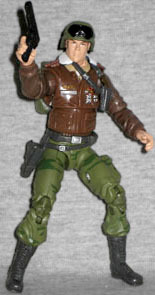 Hawk was the original field commander of the Joe Team before he got his General's star and was booted upstairs to honcho the entire GI Joe Operation. He's a West Point graduate and has a list of special education credits as long as his arm, but he still managed to get the main body of his experience out there where it counts - on the battle field. 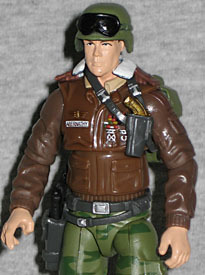 Yes, Hawk was one of the original 13 Joes, released in 1982. Of course, he was only available as a pack-in with the Mobile Missile System, so he was a rare find even among that already tough-to-find crew. That's why the cartoon chose to promote Duke, instead - he was a new figure at the time, so putting him on the show would help drive sales. And hey, it certainly worked: when Hawk came back with a new version in 1986 (the version this particular toy is based on), most kids thought he was a new character. Since "Hawk" isn't a very trademarkable name, this one character has been known as Hawk (1982-1990), General Hawk (1991-1999), General Tomahawk (2000-​2003), General Abernathy (2004-2007), and now as GI Joe Hawk. 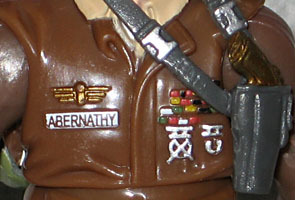 I imagine in the next few years, they'll start calling him "GI Joe General 'Hawk' Abernathy." Maybe after the movie. Anyway, when he was (re)introduced, Hawk had gotten a nice upgrade in both rank - rising from Colonel to Brigadier General - and in uniform. The original figure had been wearing a non-descript green jumpsuit, but this version gets a nice bomber jacket to pin all his brass on. Another change happened between 1982 and 1986: Hawk's hair turned brown. The original figure was a blonde, which made it really easy to confuse him and Duke in the comics - yes, they had different haircuts and body language, but when you have a blonde guy ducking behind cover and waiting to return fire, it gets tough to tell who's who. Thus, the cartoon made him a brunette, and the toy follows suit. Hooray! There's a bit of a gray drybrushing on there, too, to help age him a bit; the face on this figure looks much younger (and healthier) than the previous G3 Hawks. The level of detail on Hawk is quite impressive. His combat boots have distinct laces, and his jacket wrinkles the way you'd expect it should. The epaulets and fur trim collar are a separate piece, glued in place, but if you look too closely, you'll see it doesn't quite sit right on the figure. But forget that, and look at the sculpted medals on his chest. It's a total fruit salad! He's got golden wings on his right side, just above the cleanly painted nameplate. In 1986, the shoulder holster was sculpted onto his chest, but today, it's a separate piece. The gun doesn't come out, but the one on his hip does: that's a working holster, molded as part of the free-floating belt. In addition to the pistol, Hawk has a removable helmet and a highly detailed backpack. The goggles on the helmet are painted black - just like they were on the 1986 prototype, though the production figure's remained green. The leather jacket version of Hawk is pretty much the definitive look for the character, so it's nice that he got such a good G3 update. If only we could all just wipe his blonde-haired, green-suited origins from our minds, and pretend this is the one we had from the beginning!